WASHINGTON (CNN) -- Pirates holding a Taiwanese-flagged ship off the coast of Somalia fired on a U.S. Navy helicopter Wednesday as the aircraft monitored the ship, the Navy said. 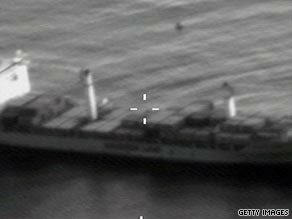 The Maersk Alabama was targeted in an April hijacking that ended with Navy snipers killing three pirates. The helicopter was not struck and all crew members were safe after the incident, the Navy said in a news release. The incident highlights the ongoing piracy problem in that region even as U.S. and coalition ships patrol the waters to deter pirates. Somali pirates hijacked the M/V Win Far on April 6. Navy officials said the vessel is being used as a "mother ship," or a floating base, to launch attacks on other ships, including the U.S.-flagged Maersk Alabama. The Alabama was targeted by pirates in an April hijacking that ended with U.S. Navy snipers shooting dead three pirates who were holding the captain of the ship hostage. According to the Navy's news release Thursday, the flight crew on the SH-60 helicopter "noticed activity" on the ship but could not determine if the pirates had fired at them. When the helicopter returned to the USS Chancellorsville, a review of its infrared camera showed the aircraft was fired on. The helicopter did not return fire, according to the release. Since the start of the year, dozens of ships have been attacked or hijacked, according to statistics from the International Maritime Bureau, an organization that monitors piracy around the world.